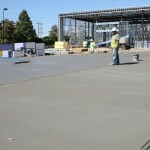 Site Prep - Kass Bros, Inc. The team at Kass Bros. knows both great buildings and great successes start with a strong foundation. Kass has decades of experience preparing sites underground for future vertical construction. Kass works with numerous New Orleans area general contractors as their preferred subcontractor for site preparation because of their reputation of quality work and timely results. Also, because Kass is an experienced general contractor themselves, other general contractors do not have to oversee and worry about Kass.